NextGen Gaming’s latest new title in a series of releases is A While on the Nile. This 5 reel, 50 payline slot is full of special features and bonuses. As the name suggests the game is built on an Egyptian theme. As such the symbols on the reels include smiling pharaohs, the eye of Ra, colourful scarabs, green jewels and Cleopatra. Pharaoh is the wild symbol and can appear stacked on reels 2, 3 and 4. 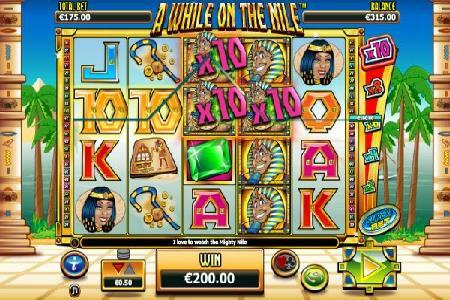 The game offers players the chance to place an additional side bet in exchange for multipliers and bigger wins. The size of the bet can be adjusted and depending on its size players can receive 2x, 4x, 6x, 8x or 10x win multipliers. Landing three green gems anywhere on the reels triggers the free spins feature. Players will initially receive 5 spins with both random and stacked wilds. Furthermore, free spins can be retriggered. Spinning three yellow and blue scarab symbols on reels 1, 3 and 5 launches the scarab bonus feature. Here players need to pick from scarabs on screen to win cash prizes. Finally the game also has a gamble feature which gives players to chance to double or quadruple winnings by correctly guessing the colour or suit of the next card drawn from a pack.